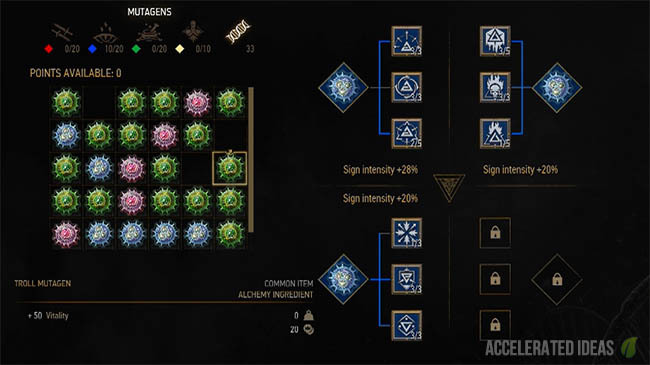 In the Witcher 3 you're given five Signs to choose from: Yrden, Quen, Igni, Axii and Aard. The default spells are fairly simple, that is until you unlock the Alternate Modes and the Signs change dramatically. In this post I'll be discussing the alternate modes and giving you my opinion as to which is the best. Those of you battling through the early stages of the game might not have had the opportunity to unlock or explore the alternate modes just yet, but let me start by saying that the fun really begins once these are available. Kind of like a supercharged version of the original spell, these alternate modes modify the way the Sign behaves and in all cases it's a welcomed change. Just like the original Sign though, the supercharged version still leans towards particular scenarios and encounters - this needs to be taken into consideration when comparing them like for like. Before you can unlock any of the alternate modes you need to spend at least 6 Ability Points in the Signs section of the Character screen. It doesn't matter where you distribute the points but you should focus on increasing the column of the Sign you're interested in first. After that, the alternate mode must be placed in a slot on the Active skill tree first. Only skills placed in an active slot will be usable. So for example, even if you unlocked the Aard Sweep ability, you wouldn't be able to use it unless you placed it in one of the "active" slots in the center of the character screen. This is illustrated in the image above. Then, to use a Signs advanced mode you simply hold down the usual Sign button (R2 on PS4) and wait a moment for the Sign to "supercharge". The exact duration varies depending on the selected Sign, but it's significantly longer than the normal Sign mode. 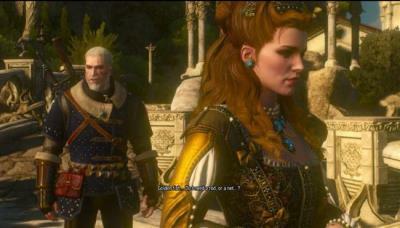 By default, the Aard Sign provides a telekinetic push to shove opponents in front of Geralt out of the way. This comes in handy both during and out of combat for breaking down doors and clearing debris, and also pushing a single opponent back ready for a counter attack. The alternate mode for Aard changes the spell into a 360 degree sweep that knocks opponents back (and sometimes down) from multiple angles. 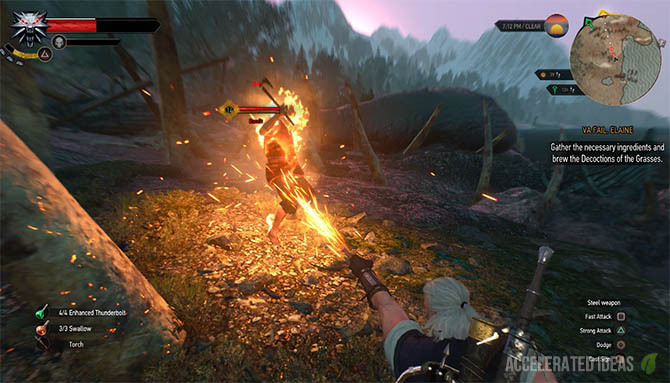 It's perfect for situations where Geralt is surrounded by many opponents, particularly bandits, drowners and fast moving monsters. These types of enemies prefer to attack in packs and you can easily get attacked from behind while trying to focus on a single enemy. Even the AI in the Witcher 3 is programmed to keep enemies together during fights and you won't see a lone enemy leaving the pack very often. 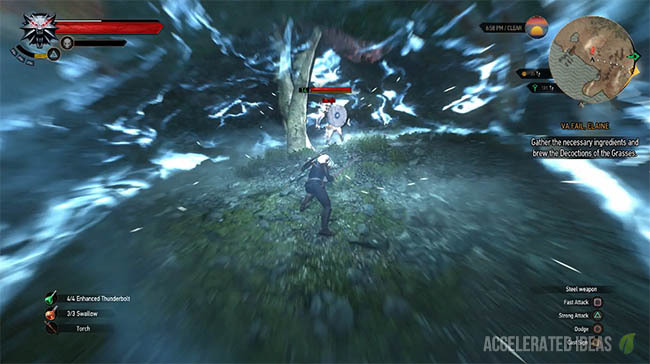 Aard Sweep can be used in these situations in an attempt to split the pack further and because of it's low stamina usage, you can dish out several sweeps in quick succession in an attempt to force a knock down..
Once an enemy is knocked down they're susceptable to finishing moves, giving Geralt the chance to finish the job very quickly. This alternate mode for Igni turns the fairly weak fiery blast into a concentrated flameflower that offers a focused and powerful attack. Of all the alternate modes, Firestream is one of the most spectactular and effective spells when in the hands of an agressive player. The charge time for Firestream is slightly longer than that of the Aard Sweep but it's still quick enough to use in the heat of a fight. The only gripe I have is that you must give yourself a split second before using it so as to avoid any attack which breaks the stream before it gets going. As you hold down the trigger, the stamina bar depletes slowly as the flamethrower burns away - almost as if you're using a tank of fuel. Once the tanks empty the flames stop and you wait for the stamina bar to refill as normal. One of the big perks of Igni is the "chance of burning" which immediately stops an enemy in its tracks and causes damage over time. For lower level opponents this burn effect can be deadly even on its own. So ultimately, Firestream will serve you well against many different types of enemies from animals such as bears and wolves through to tougher monsters like wyverns, trolls and gargoyles. It's an up close weapon and one that you can't use from afar, suiting players who are happy to be in the thick of it. You might be wondering how a shield can be changed into anything but a shield? Well you'd be right in one sense because the alternate mode for Quen is still a shield - it's just a much larger bubble shield. But there's a bonus from Active Shield which really makes a big difference - as you take damage from attacks your vitality will gradually restore. So put those Swallow potions or food items to the side because Quen can top up your Vitality as you go along. The alternate mode is fairly Stamina hungry though, but progressing the skill tree will give you a longer shield and thus the chance to restore vitality at a better rate. All in all, Quen is arguably the best Sign in the game, especially when fighting against high level monsters. You simply pop on a Quen shield and go in for an attack knowing that you've got a "get out of jail free card" in your back pocket. However, in my opinion the normal Quen Sign offers enough without the need to unlock this alternate mode. Certainly one of the more creative variations of all the alternate modes, Puppet changes Axii into a true mind controlling spell. Enemies become allies (for a limited duration) and help you fight against others in the group. Unfortunately, Puppet has a slow supercharge time, so much so that getting overrun by quick enemies is a common occurrence. Secondly, unless there's a group to fight against then the spell becomes useless as the influenced enemy has no one to attack. In the right situations, the spells distance and strength is its saving grace. I found that I could influence enemies before they engaged for a fight. Then after being influenced by Puppet, the enemy dealt some tremendous damage to his oblivious friends and even high level monsters suffered greatly. To sum up Puppet, I would say that given the right situation then it can be absolutely deadly. Ideally, Puppet could be used when you've spotted a group of high level enemies and have enough time and distance to supercharge Puppet. It'll save a lot of wear on your weapons and armour if used intelligently. The alternate mode for Yrden is a Magic Trap which you place on the floor and sit back as the trap zaps enemies in the vicinity. The trap targets enemies on it's own accord and each zap stuns and deals a notable proportion of damage. Just like Axii though, the trap doesn't suit all situations. Firstly, it's got a very slow supercharge which means you'll need more time to deploy it or you'll need knowledge of the fight ahead to prepare. I found that the trap was less effective against multiple high level targets, usually dealing decent damage but not finishing the job entirely. Furthermore, the trap requires enemies to stay in a particular area to be effective. If you're in an enclosed area then the Magic Trap will work nicely but for open spaces when you're on the move it can be ineffective. To get the most out of the Magic Trap it needs to be used against a single high level enemy in a small area. In this situation the Sign will provide strong damage and a stun effect to use in combination with your own melee attacks. How can I reset Skill Points? Exeperiementing for yourself is the best way to decide which Sign modes you prefer the most. CD Projekt Red have given us a great way to reset skill points without the headache of earning them all over again. The key to this reset (or spec option) is to visit a well known Herbalist in the Skellige Islands known as Yolar. You'll find him in a cave just to the north of Gedyneith, which lies on the eastern side of the main Skellige island. I suggest making a save point just before you attempt this so you can go back and repeat as often as you like. Once you've found Yolar, purchase the Potion of Clearance costing 1000 crowns. Drink the potion and all of your spent skill points will be returned to the pool, ready for you to spend again as you wish. Now take the opportunity to select new skills and try them out.